Building some types of fencing on a slope often involves no more difficulty than on level ground, but this is not the case with wooden privacy fencing. This fence type uses pre-fabricated panels to create a wood wall, and following the contours of a hill with those panels results in a sloppy, uneven appearance. As a result, privacy fences on hill slopes must be built using the stepped method, a process which adds more measurements and some calculations onto conventional fence-building techniques. 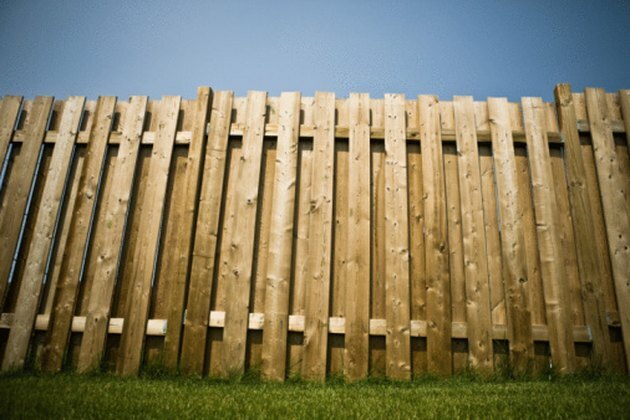 Privacy fences are essentially wooden walls. Tie a length of twine between corners or end posts along the fence line and check your stake placement for straightness against the resulting line. Replant any stakes that are out of alignment. Take down the twine. Mark a pair of additional stakes, so they stand out, and plant these at the top and bottom of the hill. Tie twine to the bottom of the upper stake, where the stake meets the ground. Run the twine down to the lower stake and tie it on there, nudging the twine up and down the lower stake until a level indicates that the twine is horizontally level. Measure the distance between the end of the twine on the lower stake and the ground to determine the how far the hill drops. Walk the distance between the upper and lower stakes with a measuring wheel to determine how long the slope is. Use this measurement and the width of the fence panels to determine how many panels are needed on the slope. A 36-foot slope and a fence with 6-foot panels needs six panels on that slope. Divide the drop of the hill by the number of fence panels to establish the distance each panel must step down on that slope. A 30-inch drop divided by six fence panels indicates each panel must be attached in a position five inches higher (or lower, depending on your perspective) than the one before it. Dig a post hole for every regular stake in the level part of the fence line with a shovel and post hole digger. Break up hard ground and small stones with a mattock. The hole needs to be twice as wide as the posts, and as deep as 1/3 of the post's height. For an 8-foot tall, 6-inch wide fence post, those holes are 32 inches deep and 12 inches wide. Adjust the depth of the post holes on the slope and dig those. These holes need to compensate for the stepping distance, but will also be set in concrete to compensate for the shallower holes. Subtract the stepping distance plus another two or three inches to provide a margin of error, then add four inches back to the depth to provide a sand foundation for the concrete plug. In this example, that is 5+2 equals 7 inches subtracted from the hole depth to compensate for stepping, for 32-7=25 inches deep. Adding four inches back to create a foundation makes that 25+4=29 inches. Install the line posts on the level part of the fence in dirt. Check the post with the level for vertical straightness, and shovel dirt into the post hole in successive layers, compacting each layer down tightly with a tamping rod. Fill in the bottom four inches of the post holes on the slope with sand. Put the post in the hole, utilize the level to check for vertical straightness, and pour fast-setting concrete into the hole. Fill the hole up to the last two or three inches from the top and wait 20 minutes for the concrete to harden. Fill in the remainder of the post hole with dirt. Attach the privacy panels to the fence posts with a hammer and nails. Set the panel against two fence posts so that the upper and lower rails are aligned with the center line of the fence post. Check the panel with a level for both vertical and horizontal straightness. Drive two nails through each end of both the upper and lower rails. Repeat to attach the privacy panels on the slope, but with the added step of attaching each panel in a position that is higher (or lower, depending on your perspective) as indicated by the drop. In this example, that means five inches. The result is that the panels will successively step up (or down) the hill in even, smooth increments.